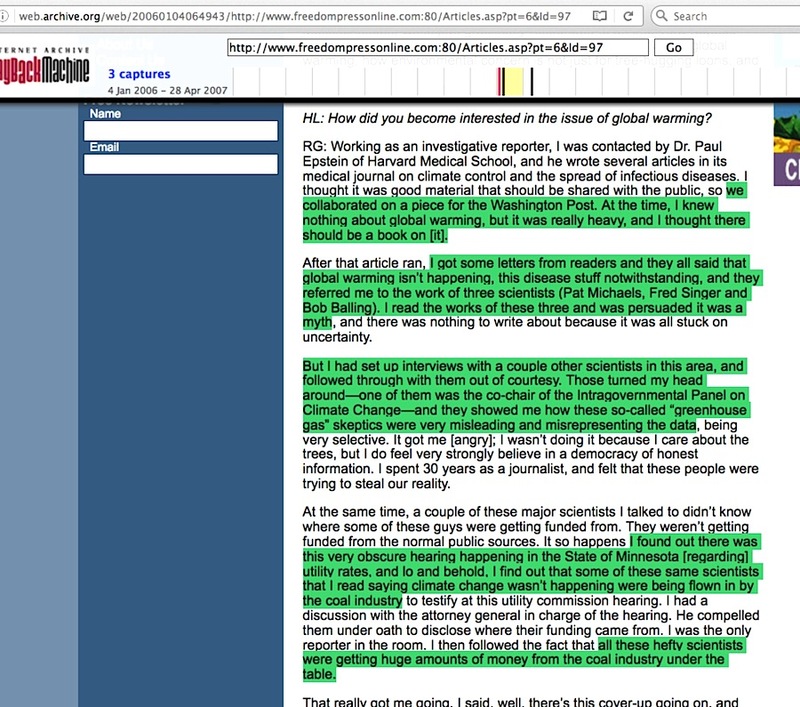 For readers who are new to this blog, there is far more to that particular situation than just a disagreement over scientific pronouncements, as I detailed in my January 16, 2015 post. 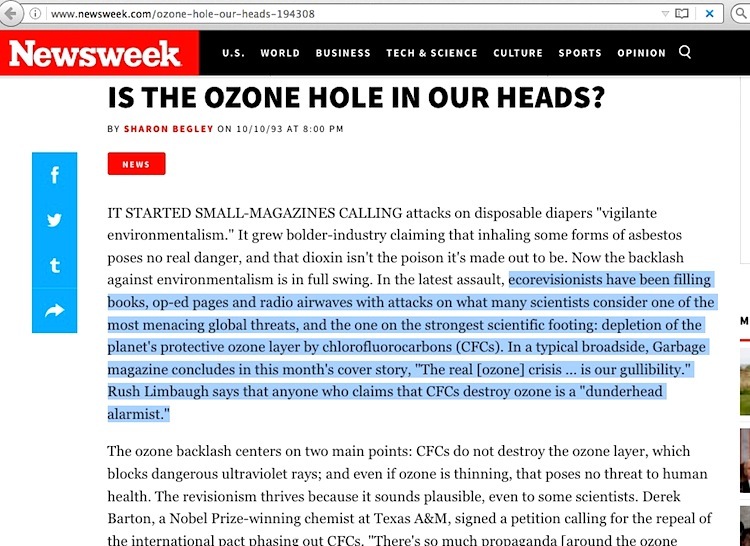 Who cares if skeptics pummel ozone science? 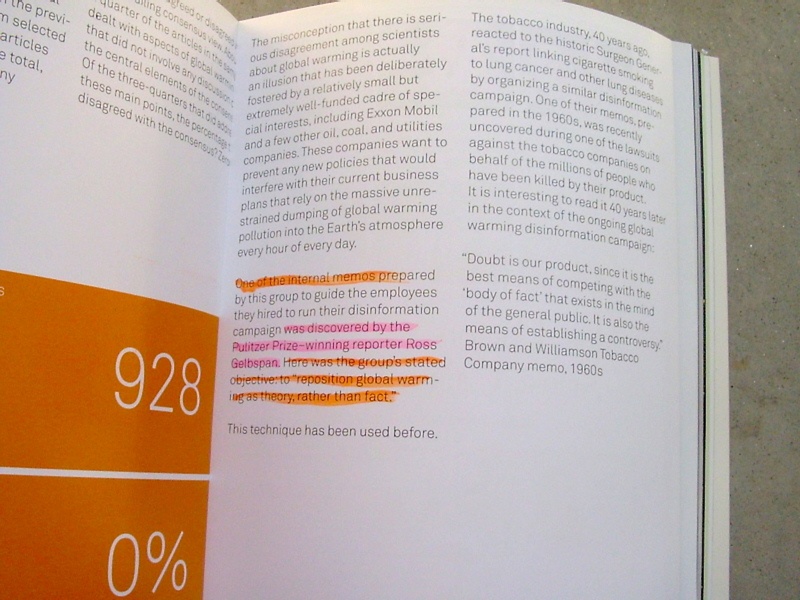 After all, the global pact calling for the phaseout of CFCs by 1996 is unlikely to change. (Ozone loss will reach 10 percent or more around the turn of the century, estimates physicist Michael Oppenheimer of the Environmental Defense Fund. Then, thanks to the CFC ban, it will recover over the next 100 to 150 years.) Yet by calling ozone science a sham, ideologues have a better chance of derailing the next environmental treaty: to control gases that trap heat in the atmosphere. How do you do that? 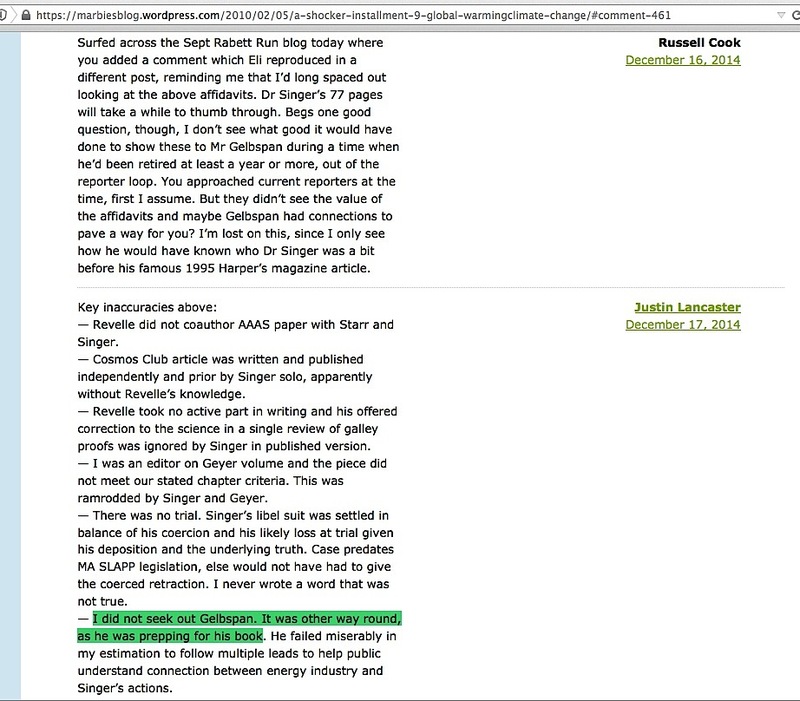 Try prompting a guy named Justin Lancaster to say Dr Singer committed a nasty act when he tricked Al Gore’s mentor and former college teacher Roger Revelle into recanting his long-held views on the harm of global warming. No need to stop there – try prompting a nationally recognized network TV journalist to say Dr Singer is a paid shill of the fossil fuel industry. 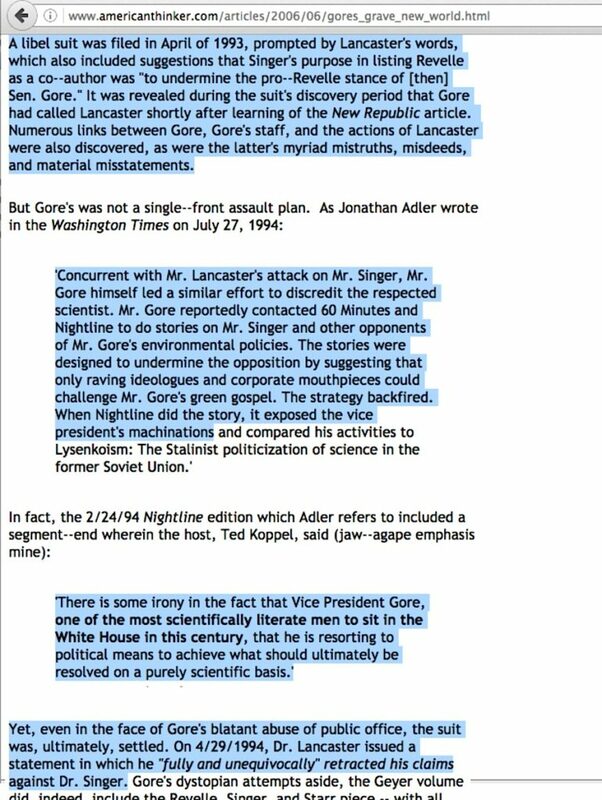 ‘Concurrent with Mr. Lancaster’s attack on Mr. Singer, Mr. Gore himself led a similar effort to discredit the respected scientist. 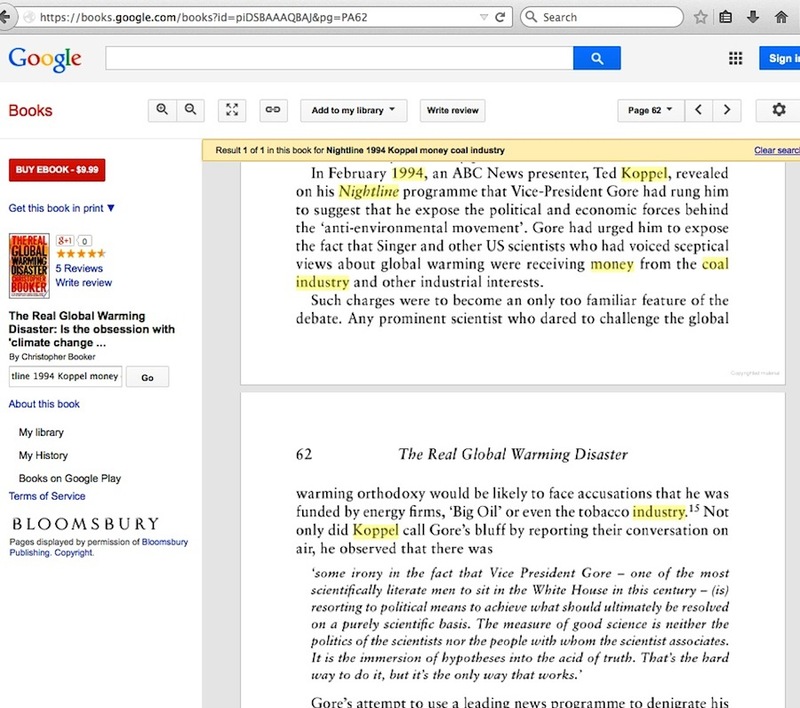 Mr. Gore reportedly contacted 60 Minutes and Nightline to do stories on Mr. Singer and other opponents of Mr. Gore’s environmental policies. 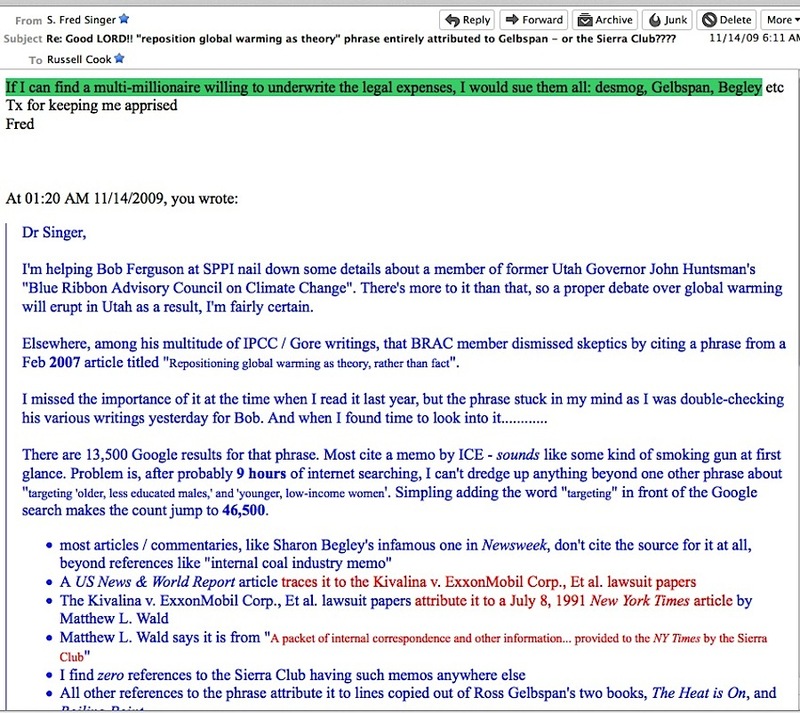 The stories were designed to undermine the opposition by suggesting that only raving ideologues and corporate mouthpieces could challenge Mr. Gore’s green gospel. The strategy backfired. When Nightline did the story, it exposed the vice president’s machinations …. Yet, even in the face of Gore’s blatant abuse of public office, the suit was, ultimately, settled. On 4/29/1994, Dr. Lancaster issued a statement in which he “fully and unequivocally” retracted his claims against Dr. Singer. So what do you do in the face of twin wipeouts? Give up? No, you just ignore the Roger Revelle episode (who?) and abandon efforts to dazzle seasoned journalists you can’t actually control, but you still concentrate on refining that second angle, since everybody with a brain in their head hates somebody who is paid to lie. 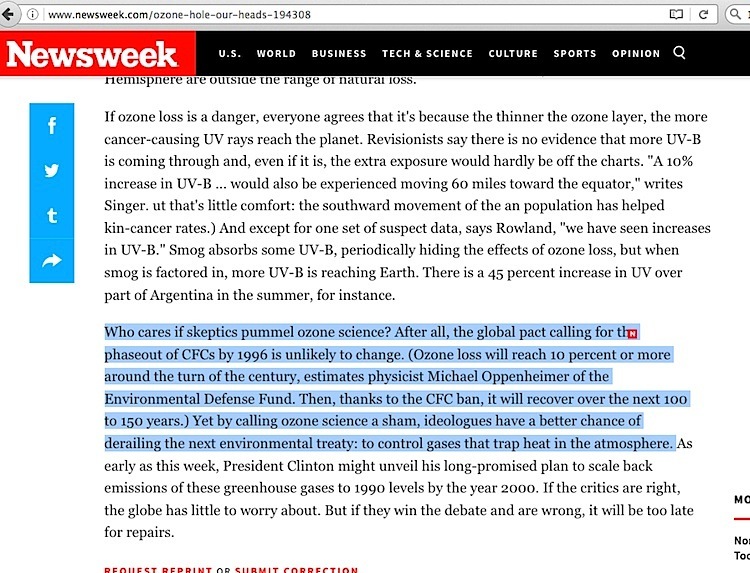 A “Pulitzer-winning reporter” ought to do fine, he can say he was a believer in the global warming issue when he was tapped to co-author a March 1995 newspaper article, then a skeptic, then a firm believer once he discovered months later that skeptic climate scientists were part of an industry misinformation campaign. Just make sure Lancaster keeps his mouth shut about specific dates, and actions, and make sure no journalists ever question the core evidence this ‘Pulitzer winner’ discovered or question anything else associated with him, lest they report the whole effort is an accusation built on a foundation of sand. The reaction from industries most responsible for greenhouse emissions was immediate. “As soon as the scientific community began to come together on the science of climate change, the pushback began,” says historian Naomi Oreskes. 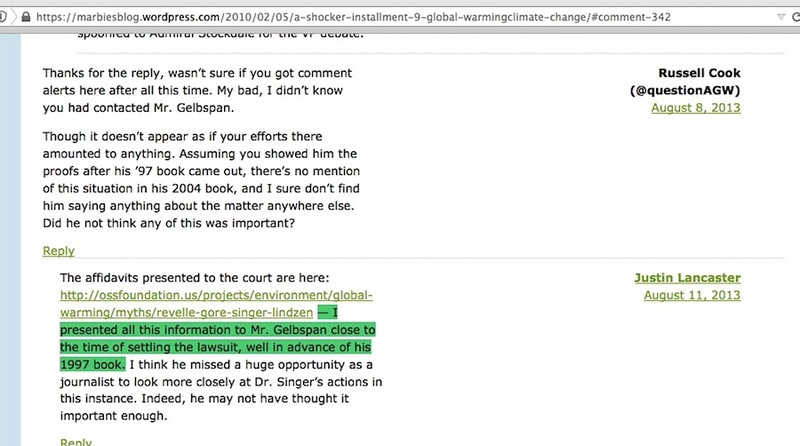 Back in late 2009, when I first told Dr Singer about the lack of substance behind narratives about ‘corrupt skeptic climate scientists’ and who those filtered back to, he replied, “If I can find a multi-millionaire willing to underwrite the legal expenses, I would sue them all: desmog, Gelbspan, Begley etc.” I still have the email. 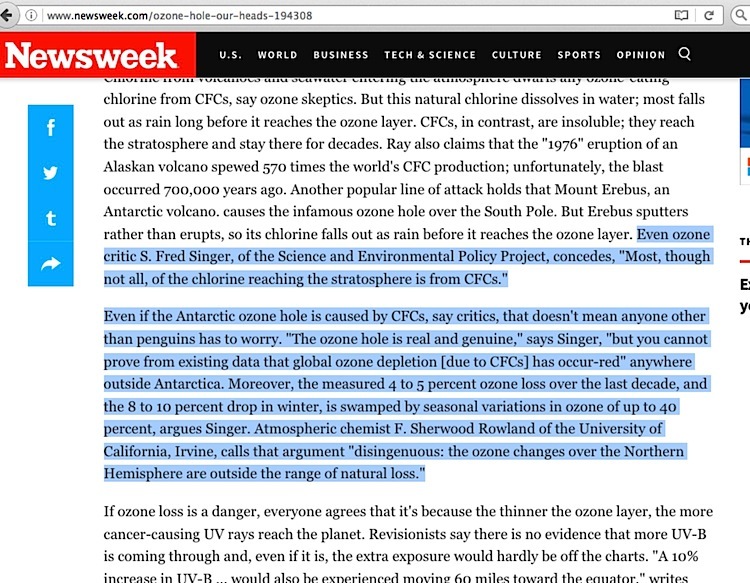 At that time, I didn’t think much could be made of Sharon Begley’s amplification of the seemingly already virally repeated “reposition global warming” phrase in her 2007 Newsweek article, and I didn’t attach any significance to her bit about initial pushback against the idea of catastrophic man-caused global warming. 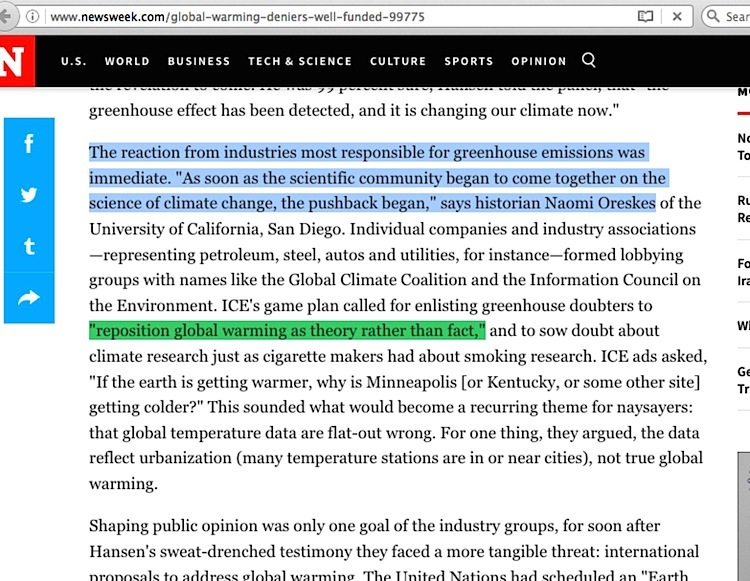 But regarding the way she all but put out a clarion call for somebody to do something about potential pushback in 1993 over a matter she had no science expertise to judge, and considering how her 2007 article quoted Naomi Oreskes, one of the few people who actually saw those Western Fuels ICE documents firsthand, it might be worthwhile for other more intensive investigators to find out just what level of involvement Begley had in formulating and carrying out character assassination efforts to shut down Gore’s critics. 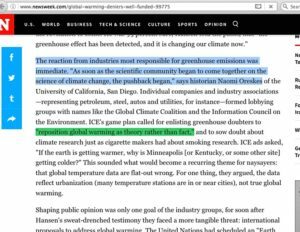 This entry was posted in mainstream media reporting and tagged Al Gore, Justin Lancaster, Naomi Oreskes, S. Fred Singer, Sharon Begley by Russell Cook. Bookmark the permalink.